Celebrating one of the most versatile materials. Wool is my favourite material to work with when weaving. I love the way it changes after washing and fulls together to create a soft and drapey fabric. And yet if you wash it at higher temperatures with more agitation, it felts together to form a stiff solid board of cloth. I love that a tightly woven wool coat will repel the rain and keep you warm for far longer than any plastic mac. I even like the smell of damp wool as it reminds me of drizzly days out as a child. Wool can be worsted and woven into the silkiest of suiting fabric, or it can be left coarse and tweedy to provide a more rustic look. I often sew with knitted merino wool from New Zealand, and it is the most beautiful fabric to work with. The colours are vibrant and deep. The fabric sews and presses like a dream. And then to wear the end clothes is a joy every time I put the item on. They are soft and smooth and light. Wool is highly absorbent and so holds dyes well with less need for chemicals. Click on the image to read about how I use this fibre in my hand weaving. In addition to all of the above, wool is sustainable, renewable, biodegradable and breathable. When burnt it produces it’s own extinguisher, so it is an ideal fibre for homewares. It also naturally filters out dust as the scaly surface can trap and hold any particles until hoovered away making it a perfect candidate for anyone with allergies in the family. It is early October, and today started out with an Autumnal chill in the air, and by 3pm the sun is beating down like it thinks it is still Summer. I am wearing a dress made from merino wool today, and it is the perfect dress for this changeable weather. It has hygroscopic abilities which means that it traps or releases moisture and humidity depending on your body temperature. To read more about wool visit the Campaign for Wool site as they have a whole host of incredible facts and details to inspire you to wear this fantastic material. 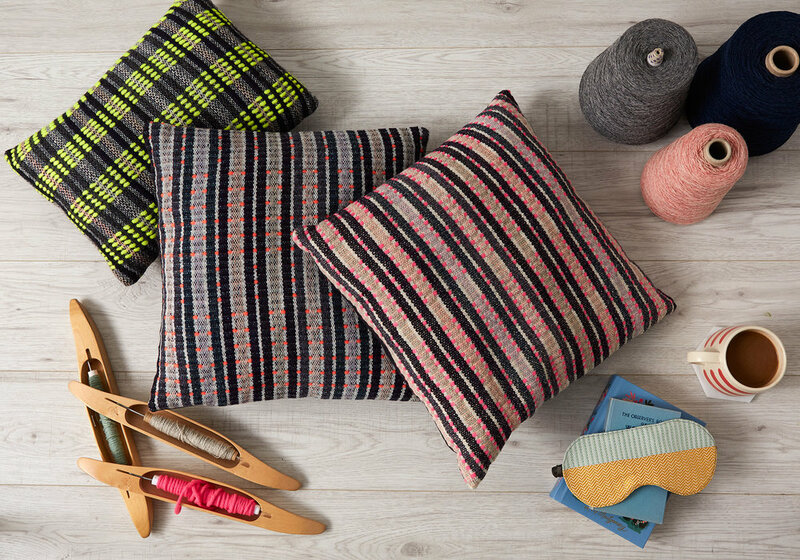 Handwoven woollen cushions inspired by a love of festivals.